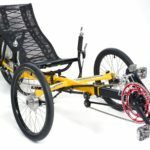 View cart “Catrike Expedition” has been added to your cart. Greenspeed‘s delta trike, with disc brakes and a rear differential. Superior comfort, easy mounting, a higher seating position. Great for people getting back into cycling or even those starting out! The Greenspeed Anura is designed to be easy to ride. Rather than having a low seat like most tadpole trikes (2 wheels front, and 1 rear), and some deltas (1 wheel front, and two rear) the Anura seat is set at the same height as a kitchen chair, at 17 to 18” above the ground, plus there is no cross member or front axle in front of the seat, so mounting and dismounting is much easier. 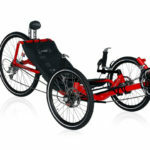 The higher seat also gives more confidence in traffic, yet having the seat closer to the paired wheels than the single wheel gives more stability than expected. Unlike other delta trikes the Anura has a differential as standard equipment, which gives balanced two wheel drive. And with 75% of the weight on the driving wheels V 33% for a tadpole trike, the Anura has far superior traction on loose or slippery surfaces, like gravel, mud, or snow. 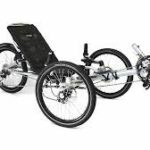 The three wheel disc brakes provide more powerful braking than most trikes, and steering is light, positive, and accurate with a small turning circle. To reduce weight the Anura frame is made from 7005 aluminium alloy, and the rectangular main tube allows the length of the frame to be varied by 10 inches to suit the leg length of rider, while keeping the front frame in perfect alignment. 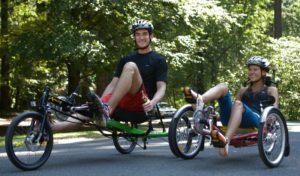 16” wheels are standard on the Anura because they result in a lighter and more compact trike, than could be built with 20” wheels. Furthermore with the special Scorcher tyres they roll easier and give a better ride than most 20” wheels! However for a still higher seat and more ground clearance, 20” rear wheels are now available, and later in 2013 there will be a 20” front wheel option. Another feature of the Anura is the square section rear axle brace tube, which has been designed as an integral towbar, and has a 12 mm boss which can be used for towing trailers, or for accepting the Tandem Coupling. This Tandem Coupling enables the Anura to be converted to a tandem, triplet or even a train of Anuras, by removing the front wheel of the stoker’s Anura, and fixing the forks to the coupling. This has meant that a number of people with serious health issues, who thought they would never, ever be able to cycle again, are now riding again with their loved ones! 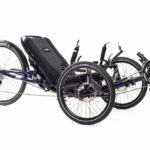 In fact the easy mounting of the Anura and its adaptability has seen riders with serious illnesses, like for example MS, make miraculous improvements to their life through regular exercise in riding the Anura. Cassette SRAM 11 – 28t 9speed Nu Vinci SRAM 11/28 9sp.